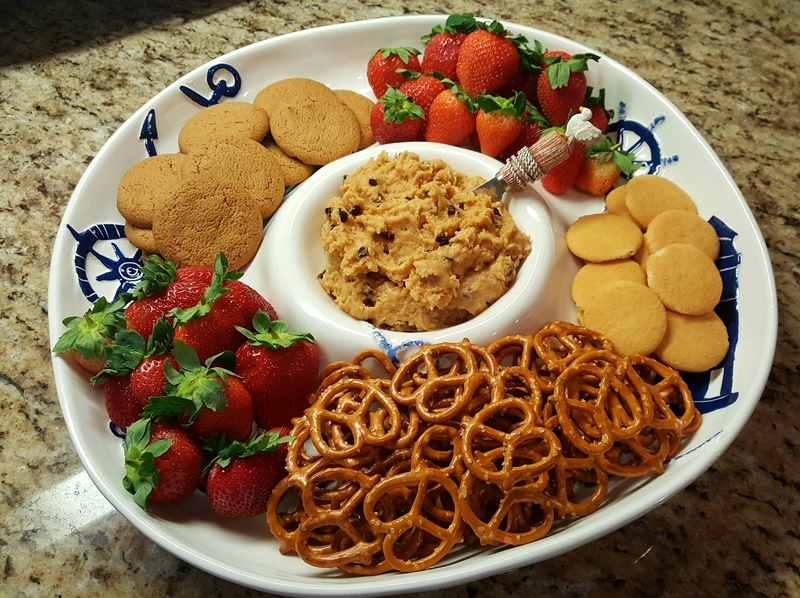 Chocolate Chip Peanut Butter Dip makes a sweet snack for enjoying with pretzels, vanilla wafers, fresh strawberries and ginger snaps. There are 14-layer cakes, lattice pies, meringues and souffles. 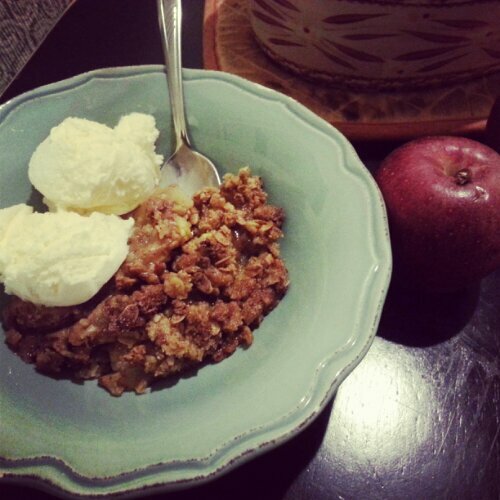 Then, there’s Apple Crisp. Labor intensive, complicated desserts have their time and place, but a dessert that’s good enough for a weeknight is good enough for me. No other delicacy screams fall and comforts the home and heart like it. What’s more, the dish is easily adaptable for large or small crowds. Dinner for two? Serve it in ramekins. Family coming for Thanksgiving? It’s time to dust off that trusty ol’ casserole dish. With its warm nutmeg and cinnamon spices, served alongside a scoop or two of cold vanilla ice cream, it’s the fall season in a nutshell (or in this case, a bowl). 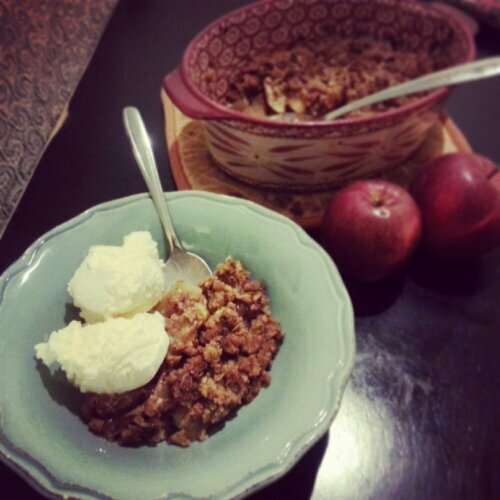 After a dinner of chili, Apple Crisp hit the spot. The crunch of the granola and earthiness of the pecans, with the tart and sweet combination of apples is foolproof flavor. My home smelled just like the mountains, and made me wish I was sipping coffee in a rocking chair somewhere up in Tennessee, admiring the changing leaves. My recipe serves 4-6. Enjoy! 1 Tablespoon of lemon juice (This keeps the apples from turning brown). Peel and slice apples. Place in a medium bowl and add the remaining filling ingredients. Set aside. In another small bowl, stir together flour, sugar and chopped pecans. Cut in cold butter with a fork or you can blend the ingredients quickly with your hands. Pour filling into a 1 1/2 quart or 8 x 8 casserole dish and top off with the brown sugar mixture. Sprinkle with granola. Bake in 375 degree oven for 35 – 40 minutes. Let cool slightly. Serve with ice cream and coffee, preferably on the porch. Don’t forget to eat the leftovers for breakfast the next day! Summertime may be my absolute favorite time to visit the farmers’ market and fruit may be my absolute favorite thing to purchase. 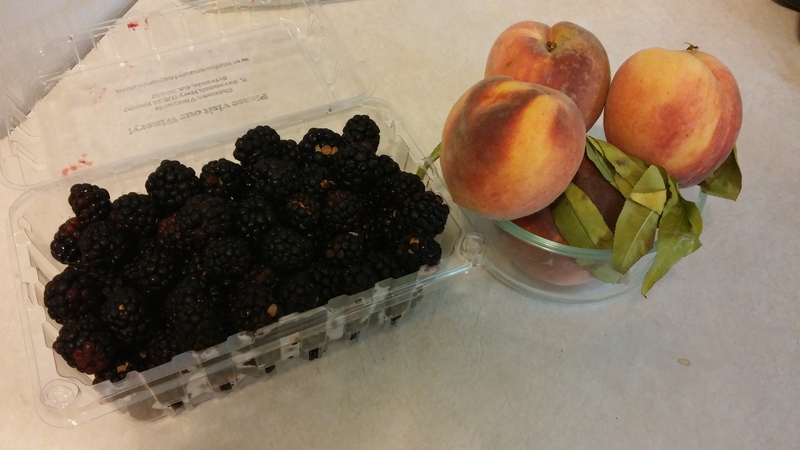 On Saturday morning, I scored a large package of plump blackberries and the season’s first Georgia peaches. 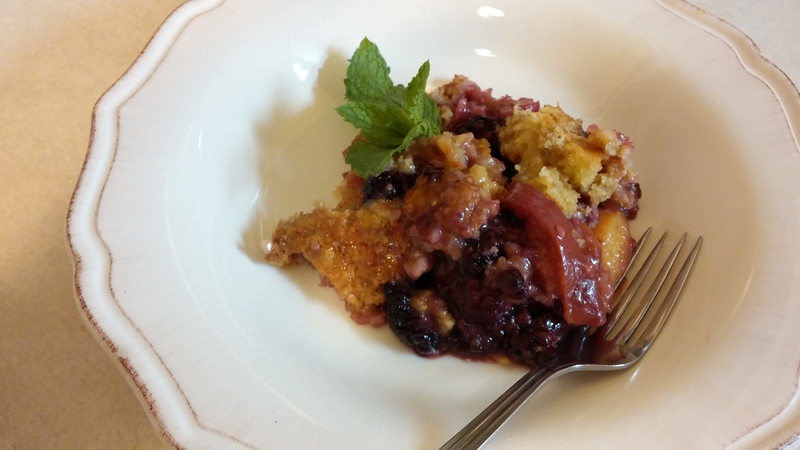 You can imagine my excitement when I came across a delicious recipe for Peach-Berry Crumble in the latest edition of Southern Living. Sunday afternoon just got better. Fruit from the fields of Screven County. I paid $5 for this huge container of blackberries. You can’t beat that! Well worth the money, especially knowing I’m supporting the local farming community. Thanks Ricardo from Poor Robin’s Produce! 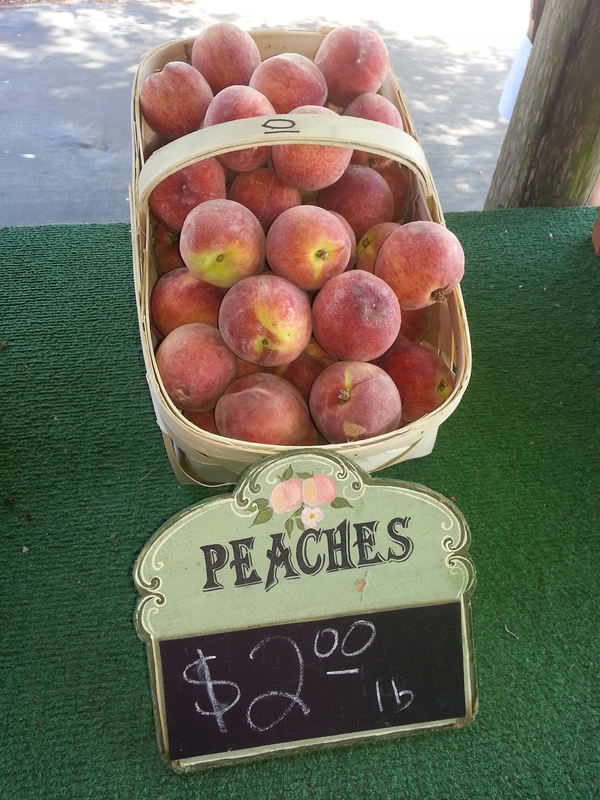 The peaches came from my friends at Jacob’s Produce. I snuck a few pieces while slicing them for the crumble. Irresistible, juicy and sweet. Crumbles make the perfect summer dessert. Simple to throw together, they’re special enough for entertaining yet quick enough for a post-dinner weeknight treat. I substituted 1/2 cup of uncooked regular oats with Honey Bunches of Oats with Vanilla. It’s what I had on hand and it got the job done! Assembling this dessert is so much fun because it’s rustic and hands-on. Butter makes everything better. Bake for 40-45 minutes at 375 degrees. The end result is a crunchy, buttery topping filled with warm, sweet fruit. Serve with cold vanilla ice cream or sweetened whipped cream. Garnish with fresh mint. Savor summertime! Here’s a quick glance at the recipe. Thanks Southern Living for the inspiration! Preheat oven to 375°. Place first 2 ingredients in an 11- x 7-inch (or 2-qt.) baking dish. Stir together egg, egg yolk, and next 4 ingredients with a fork until mixture resembles coarse meal. Sprinkle over fruit; drizzle melted butter over topping. Bake 40 to 45 minutes or until light brown and bubbly. Let stand 10 minutes; serve warm with ice cream. Watch My Video Segment on The Dr. Oz Show MONDAY! 2014 is off to a great start! Tune in to The Dr. Oz Show this Monday, Jan. 27 at 4 p.m. on WSAV-3 Savannah to watch my video segment during Dr. Oz’s Healthy Recipe Challenge. I was asked to submit a healthy recipe to represent my home state, featuring Georgia peaches. Three finalists were chosen to appear on the show to have Dr. Oz taste their dessert. Though I wasn’t chosen as one of the top three finalists, the video I submitted will appear in a segment! Be sure to check your local listings for the time the program airs in your area. 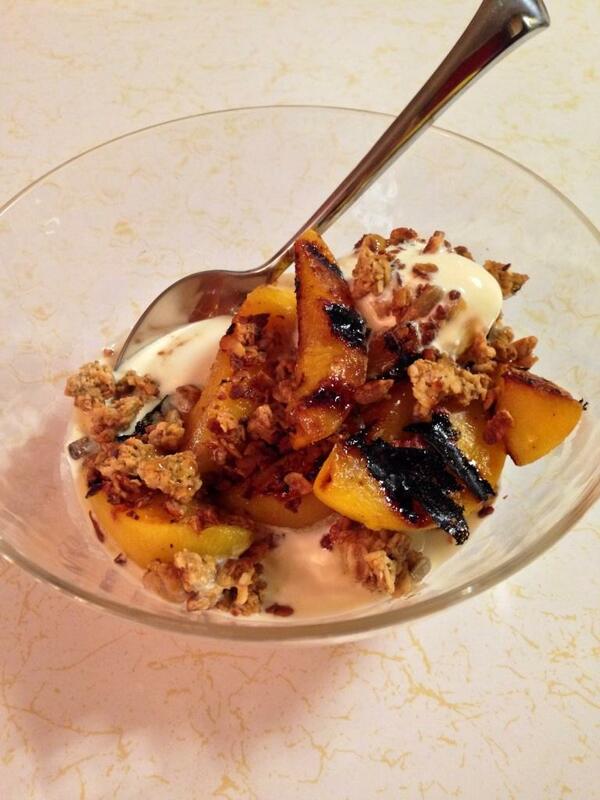 I submitted my Grilled Georgia Peaches with Toasted Granola and Honey. If you’ve never tasted grilled peaches, start living. Something about grilling fruit makes it that much more desirable, and Georgia peaches really shine in this lightened up dessert. While we all know there’s no real substitute for one of Georgia’s best Southern recipes–good ol’ peach cobbler, this dish satisfies your sweet tooth without packing on the pounds. The great thing is, when fresh peaches aren’t in season, you can substitute frozen ones. The peaches may also be grilled outside or on an indoor grill pan. Not an ice cream fan? Forgo it and serve it with fresh, sweetened whipped cream instead. To grill a fresh peach, slice it right down the middle, remove the pit, brush the halves with melted butter and season with kosher salt. Allow the peach to grill skin side up for about 3-4 minutes. Meanwhile, toast granola in a saucepan over medium heat, about five minutes, stirring slightly, until golden brown and fragrant. Place 1-2 scoops of cold ice cream in a bowl. 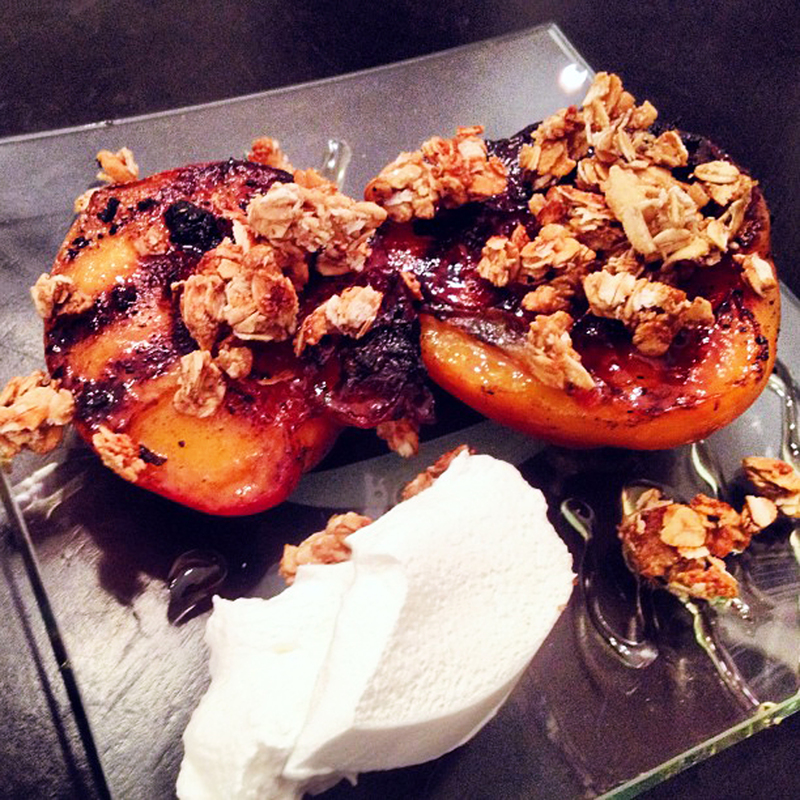 Top with grilled peaches. Sprinkle with granola and drizzle with honey. Once the program airs, the episode will be available online here. Also, be sure to check back on Some Kinda Good for what you won’t see on the show…my blooper reel!! Thanks for watching, y’all. P.S. A few other bloggers from around the U.S. will also be featured on The Dr. Oz Show. Check out the recipes they offered up to show state pride! New to Some Kinda Good? Welcome! I’m a Georgia food writer and Statesboro-based TV personality. A Season 2 Contestant on ABC’s “The Taste,” I’m honored to make my second national TV debut on The Dr. Oz Show. Some Kinda Good is a Southern, coastal food blog highlighting East coast restaurant reviews and Lowcountry-inspired recipes. I hope you’ll stick around, and follow me on Twitter at @SKGFoodBlog or find me on Facebook. If you want, learn more about me, and thanks for visiting! Blackberry Cobbler and No Vanilla Ice Cream? What a Tragedy!! 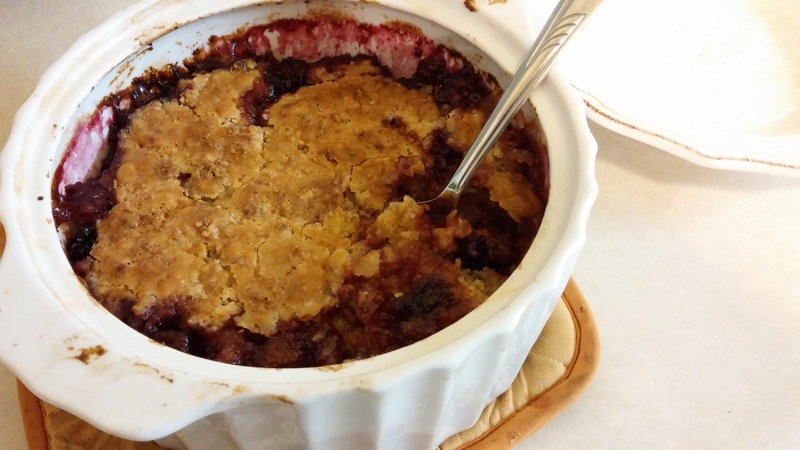 I hadn’t been in my new home 48-hours when I decided to break the kitchen in and cook up a blackberry cobbler from Paula Deen’s Southern Cooking Bible, one of my favorite Christmas gifts. Though mixing bowls, pots and spoons were still boxed up, I knew a little digging would be worthwhile for this southern classic—and believe you me, it was. Start by bringing a cup of sugar and four cups of blackberries to a boil. I used frozen blackberries because they’re cheaper and I had them on hand. I just love blackberries. 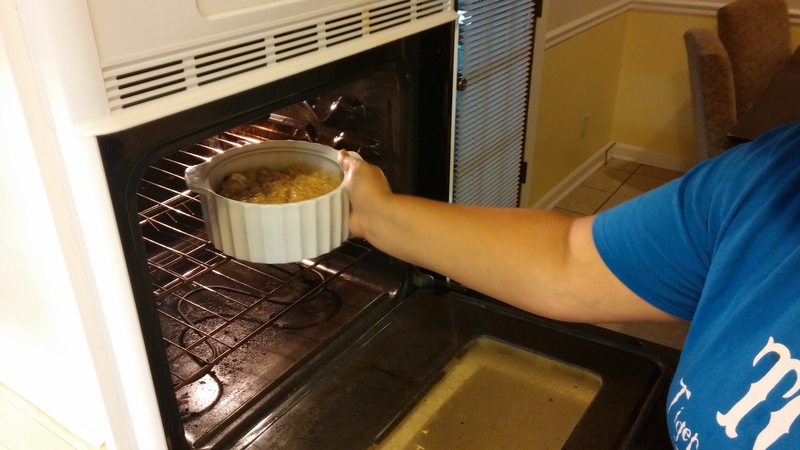 Once the oven was pre-heated, I melted one stick of butter in my new casserole dish (thanks mama!). After combining the dry ingredients, whisk your milk in slowly to prevent clumping. Next, pour the mixture into the melted butter, but don’t stir. I love to see the sugar and blackberries come together. You could pour this combination right over the top of ice cream as is, or blend it up with some ice cream and milk and have you a blackberry shake. 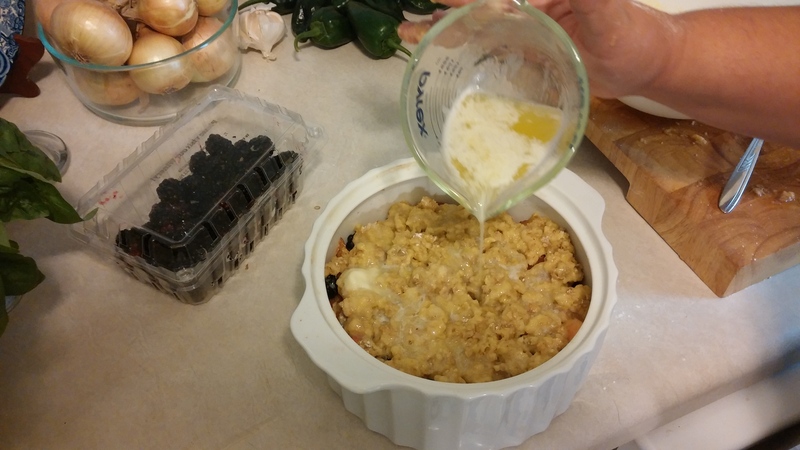 Then, spoon your blackberries into the dish evenly throughout. This part is fun. Don’t forget your sauce. Drizzle it down over the blackberries. 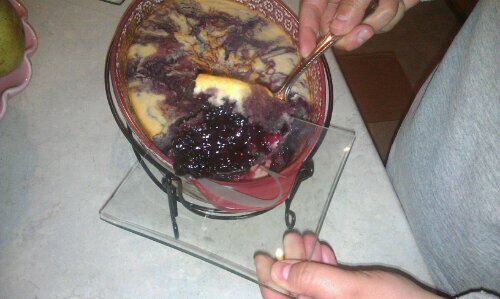 Once it cooks up, you’ll see it swirled all through the cobbler. Beautiful! 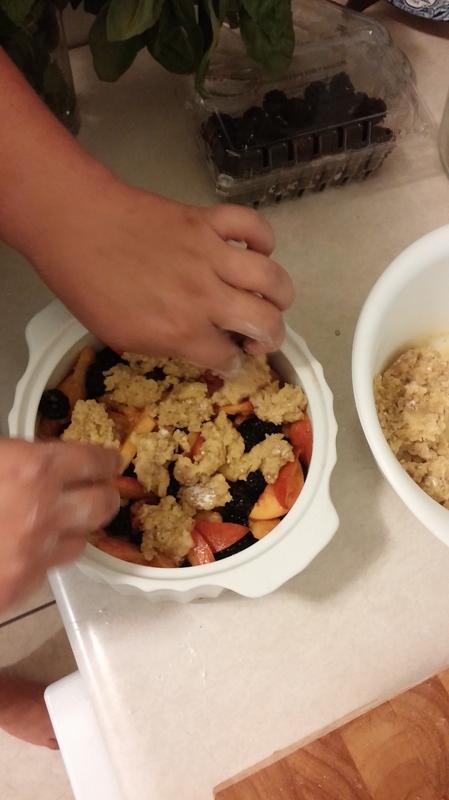 The cobbler is ready when it’s lightly browned and firm to the touch. Never have I wanted a scoop of cold, vanilla ice cream so badly…what a tragedy that there was none in the house.